A disastrous avalanche… an evacuation… and mysterious residents who turn cold right before your eyes… literally! In this sequel to the classic hidden-object puzzle adventure game, you’ll find secrets buried under an avalanche of snow in Phantasmat: Crucible Peak. 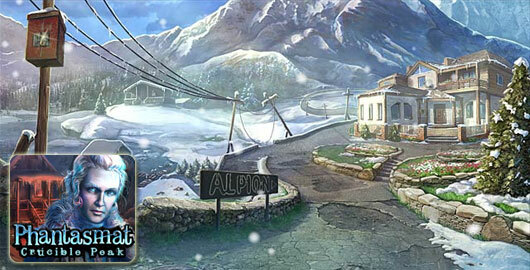 You planned for years to ski the Alps, but your dream vacation turns into a nightmare when you stumble upon a resort town, lost five years ago in an avalanche. Uncover the mystery of what happened here. Did anyone ever really survive? For a more in depth experience, check out the Collector’s Edition. Posted on Tuesday, January 8th, 2013. Follow any responses through the RSS 2.0 feed.